Michael Lange OD, CNS discusses Natural Dry eye treatment and meibomian gland dysfunction. I have seen what the power of proper nutrition , heat with gentle massage, proper lid hygiene and a good lubricating eye drops can do for my dry eye patients. In clinical practice for over 20 years I have helped dry eye patients from all over the world . The goal is to eliminate the microbial flora that blocks the meibomian glands, cut inflammation in the glands and unclog the meibomian glands so they secrete a healthy tear film. If the steps are followed religiously then a very high percent of patients will improve. 1. lid scrubs with a good lid foam similar to occusoft foam or cliradex, If lids are quite inflamed and red and crusty the combination of both work quite well. Scrub lashes first with occusoft then rub the Cliradex onto lashes and lids before bed. This combination will rid the eyes of blepharitis. This gets rid of the microbes like demodex, staph and seboreha that clog the meibomian glands, An inexpensive option is using baby shampoo to gently scrub the lashes then rinse with warm water. 2. Take omega 3 fish in the triglyceride form with a minimum of 1600 mg of combined EPA and DHA. When reading the label make sure it says triglyceride form or TG form, if it doesn’t state this then it is ethyl ester form of omega 3 and contains ethanol. I recommend staying away from this form of oil due to its unstable molecule and can go rancid quickly plus not as bio available as TG form. 2 Fortifeye Super Omega gives you the ratio or omega 3 necessary to help dry eyes if you weigh less than 240 lbs. If over 240 lbs I recommend taking 3-4 Fortifeye Super Omega. For really dry eyes I also recommend taking 6 mg of astaxanthin ( fortifeye focus) and Black Currant Seed oil with 140-160 mg of GLA. GLA for dry eyes in the right combination to omega 3 fish oil is beneficial. Astaxanthin is a super potent antioxidant and anti inflammatory and is my favorite single nutrient. 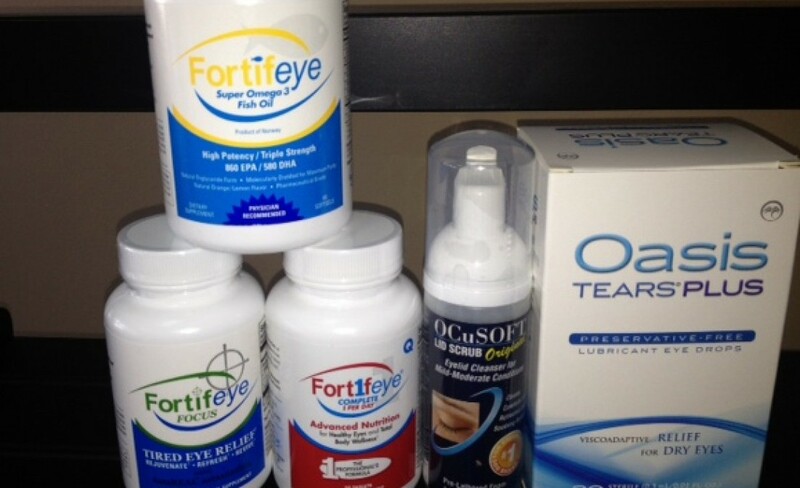 If you are not taking a good multi vitamin that has no beta carotene then I recommend taking Fortifeye Once Daily to ensure there are no nutrition deficiencies aggravating a dry eye condition. 4. a good unpreserved lubricating eye drop that has hyluranic acid in it tends to last much longer and be more effective and helping reduce dry eye symptomatology than the typical otc eye drops. . I recommend either Oasis tears plus or Blink. For the extreme dry eyes and meibomian gland dysfunction I like to use either oasis tears or blinks as well as the addition of a relatively new unpreserved artificial tear called Retain MGD. 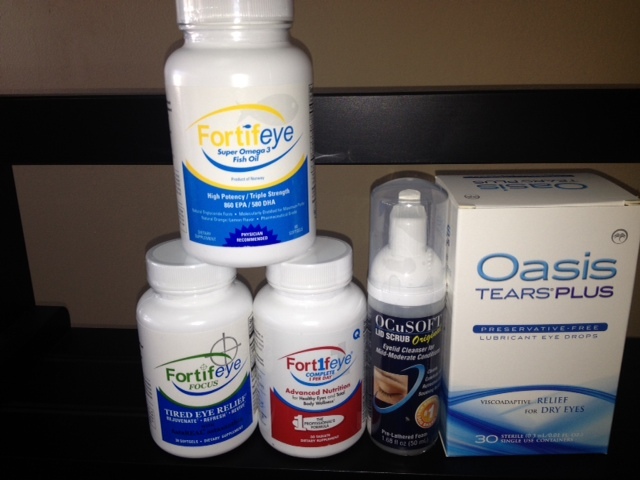 This combination helps to replenish all layers of the tear film and reduce dry eye symptoms dramatically. Tags: blink eye drops, brueder mask, cliradex, dry eye patients, fortifeye once daily, GLA for dry eyes, meibomian gland dysfunction, michael lange od, michael lange od cns, natural dry eye treatment and meibomian gland dysfunction, oasis tears plus, reduce dry eye symptoms, retaine mgd, unpreserved artifical tear, unpreserved lubricatiing eye drop | Permalink.